An incredible video of a herd of these magnificent beings caring for a baby. Every now and again I see a video that makes me smile and realize, once again, thatnumerous nonhuman animals (animals) are deeply caring, compassionate, and empathic beings. All too often media represent animals as mean and aggressive individuals. And, while animals do indeed on occasion fight with one another, it's still very clear that dismissively and pejoratively calling a human being an "animal" because they engage in violent activities is a misrepresentation of whom nonhumans really are. They say a picture is worth a thousand words, and this video of a herd of elephants rescuing a baby elephant who decides for some reason to lie down on a busy highway in Kruger National Park in South Africa is well worth numerous words and the two plus minutes it'll take to watch it. 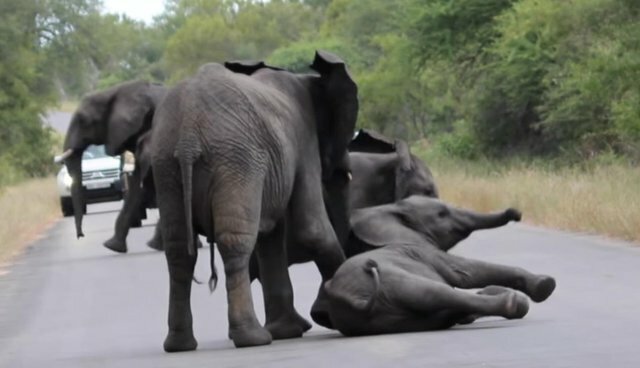 You'll see the baby lie down seemingly without a care in the world, and then a group of elephants come in and clearly try to coax the youngster to stand up and move off the highway.